This is the new Manker E02 sent to me for review from Manker and no other compensation other than the light in return for my review. 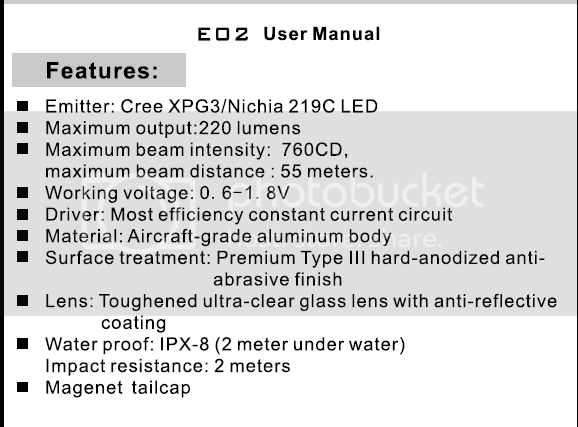 The E02 is a 90 degree head , AAA powered light (also NiMH can be used) and has the appearance of many of the headlamps that are on the market now with the 90 head. It would make a good candidate for a small headband , if Manker so took the notion to make one for this light , but that is just my opinion. I received the black anodized version of this light for my review and they also will be making a grey colored one as far as I know. The anodizing on the sample I recieved appears to be very well done. I have not found any bare spots or thin spots on the sample I received (other than where I banged it on a metal post accidently , I made a scuff mark but it did not go through the finish) The finish is a nice looking Flat or Matte finish and the knurling is also well done on the light. The threads are square cut and very well cut and they were lightly lubed upon receipt. My sample came with the Lanyard , 2 extra O-rings and even an extra clip in the box , which was a nice surprise. The overall size is 73 mm long , 15.75 mm in the middle of the tube and 18 mm at the widest part of the head. 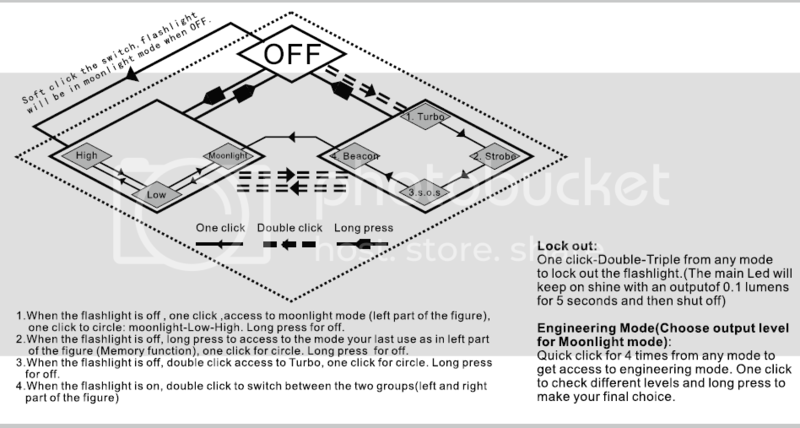 Both ends of the tube threads are anodized , so manual lockout is possible from either end , as well as the electronic lock out feature in the UI. The end of the tailcap has a fairly strong magnet on it so the light can be used for a lamp or work light if attached to a metal surface. The stainless clip can be used on either end of the light and it seems to be a fairly sturdy built clip and is pretty stiff , so it should stay in place well. The overall the build quality of the E02 is very good and I really do not have any complaints with this little light , as I like it alot. NOTE: I used a Rayovac 600mAh NiMH cell for my testing. I do not have any Eneloops in the AAA size (just yet) , but I feel they would give a better run time than what I used for my test , as my AA size Eneloop pro always perform better than the Rayovac NiMH I have in that size. 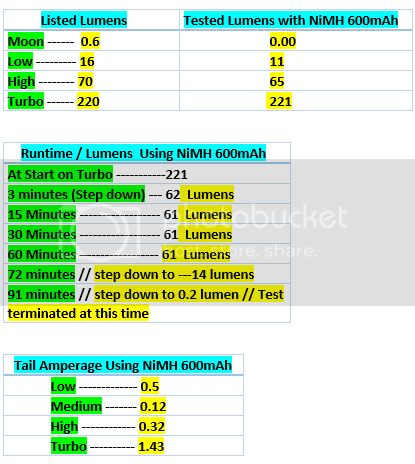 The testing I did on this light is listed in the charts below………. Again I will say…….my cheap video camera does not show as true to life as the still shots in the video portion as to what I actually see. 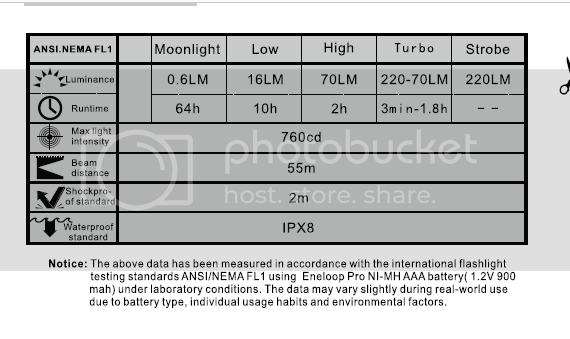 There is a couple of shots comparing the Thrunite T01 with the E02 at 10 and 25 yards…..the very last picture of the Thrunite is labeled 10 yards but should be labeled 25 yards. For those who do not want to watch the whole video the stills of the light and beamshots start at 6:06 in the time line and the live outside footage starts at 9:57 of the time line. Nice work Robo, neat little light that could come in handy in a lot of scenario’s. Not sure how they get 200 lumens from a boosted NiMH AAA cell but that’s a decent amount of light coming from such a small pocketable light. The magnetic attachment will probably make it useful in a LOT of ways! Nice review, especially appreciate the tailcap current. Looking forward to this light being released, I can see picking it up. As far as AAA goes, this does it all. I like being able to start in moonlight mode OR a normal mode if desired with one click. Also tailoring the moonlight mode sounds fun, but I am guessing it is not super practical. Thanks Dale…yes it was a surprise to me also to see how much light comes out of this little thing. Thanks Sbslider…No problems taking the current I try to get a tail current any time I can with the lights. The moonlight mode stays set after you set it one time also , really not that big of a deal in the end. I am with you on the headband Mrmatt……maybe they will make a nice one for this little light. I guess what I meant by my comment is I am not sure how much of a practical difference it would make to be able to tailor the moonlight mode. Although I think I did see in another review that it is a pretty wide range of adjustment, even to slightly above 1 lumen, so perhaps this could be handy if you knew you needed a bit more umph in some situation. I could see that being handy for camping, likely a bit more output from a moonlight mode would be good in the outdoors compared to inside. Can’t wait for these to become available. You are right the moon mode does have a wide range and I have now carefully counted each step and found that there are 21 levels instead of the original 16 I had stated. I have seen so many times where a number of people either complain about a moon or firefly mode being too bright or too dim on a given light for their liking. Some like a super low moon while others like a little brighter moon mode , I am sure according to their own eyes and how sensitive they are , how good the individuals vision is etc…..
That was what makes me like the ability to set the moon mode to each persons desired liking , as then there is no complaints and you have your own perfect moon level for your eyes once you set it where you like it for yourself. Again this is a personal observation and the adjustable moon mode may or may not be liked by others as well as it is by myself. Agree with your assessment. I had not thought of it that way. terrific AAA light, will have to pick one up when available. Thanks SP…….I haven’t seen a price yet , but I think it should be announced soon , unless it has been already and I just haven’t seen it. They said $19.95 in post #15 of Budda’s review thread of this light. price $19.95, do you like? Thanks for the info….. I never saw the price. looks like a nice little light. I have looked at a few of these review, and each shows the user interface sheet screenshot. Some of those user interface sheets mention dragon breath, and others do not. How I saw how to get into that mode was to turn the light off and continue holding down the switch will get the light into dragon breath mode. In this mode the there is a light behind the switch that pulsates slowly. Does your light have the dragon breath feature? If mine has that feature I am unable to find it on the user guide or the light either one. So there is a headband planned for this light? I believe Manker is thinking about the option on the headband. Hmm.. I wonder how effective this will be as a headlamp. It’s probably too focussed for close up things and not bright enough for distance. It’s a ‘must have’ though, i ordered a grey one with XP-G3. Hmm.. I wonder how effective this will be as a headlamp. It’s probably too focussed for close up things and not bright enough for distance. It’s a ‘must have’ though, i ordered a grey one with XP-G3. It isn’t bad for close up work and It does well out to around 35 or 40 yards , it is a more floody beam though not throwy.